The United Kingdom of Great Britain and Northern Ireland is the official name of the state. It is geographically situated on the British Isles. The UK is one of the smallest countries in the world. Its total area is about 245,000 square kilometers and the population is over 60 million people. Four countries that make up the UK are England, Scotland, Wales and Northern Ireland. The British landscape can be divided into two kinds - Lowland Britain and Highland Britain. The UK is surrounded by great body of water all around. It also has rivers but they are not very long. The Thames is the most popular and the most important river. The climate in the UK is mild and moderate. But the British people say, "Other countries have a climate, in Britain we have weather". 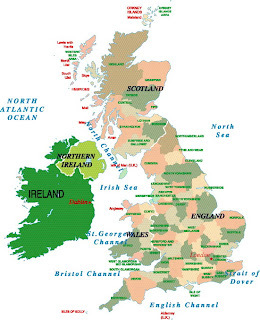 People of four main nationalities inhabit the United Kingdom of Great Britain and Northern Ireland. They are: the English, the Scots, the Welsh and the Irish. These four nations make up the British nation. British law does not recognize any language as official. They speak English, Welsh, Irish and Scottish languages. English people like reading a lot, especially newspapers, and talking about the weather. They are considered to be the greatest tea drinkers. The British are polite and well-mannered people. They tend to be rather conservative and reticent. Every Englishman is a countryman at heart.